Are you sick of apple pie yet from Thanksgiving? Hope not. 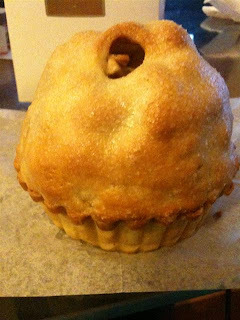 This is a picture of an Apple Pie I picked up from Black Hound last week when Mr. T had a hankering for something sweet. I was intrigued first by the enormous dome top to this mini pie. How in the world did they get it to bake up this high? Then I noticed the description said this was a cookie dough crust with Granny Smith apples. Whoa! Cookie Dough crust? What a great idea! So I brought it home and we dug in immediately. 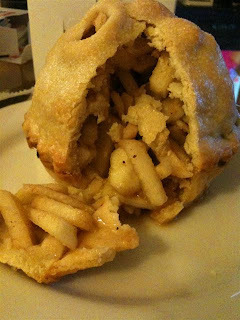 As you can see there are a ton of apples stuffed inside this thing. I mean a ton! Unfortunately it seemed that in the madness of all of the apples they forget to put in some sugary juice. The best part about an apple pie for me is that sweet, sticky, cinnamon sugar sauce that the apples create after baking. Part of me wonders if Blackhound macerated the apples first so there wouldn’t be as much of a gap between the crust and filling. That method works fine when you remember to add the juices back to the apples before baking, which clearly they had not. 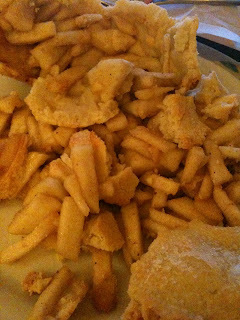 This left the apple pie dry and boring. It’s too bad because the sugar cookie crust was absolutely wonderful! I still love Black Hound but I’m gonna stick with what they do best- mini cakes. I’m leaving the pie baking to the NYC diners and Mr. T's mom- she makes the best.